Salesforce.com or SFDC is award wining CRM tool and many companies have started using the Salesforce because of flexibility, userfriendly and lots of applications available. Developer Account can be created, free of cost from here. In previous article i have demonstrated that how to install force.com IDE in eclipse. So, if you have above softwares then we can start with the actual development of application. here, i hope that you have setup the eclipse with your salesforce account. Right click on Salesforce project in eclipse and select Object (Custom object). For this tutorial, i am creating student object. so in rest of tutorial we will continue with this object. 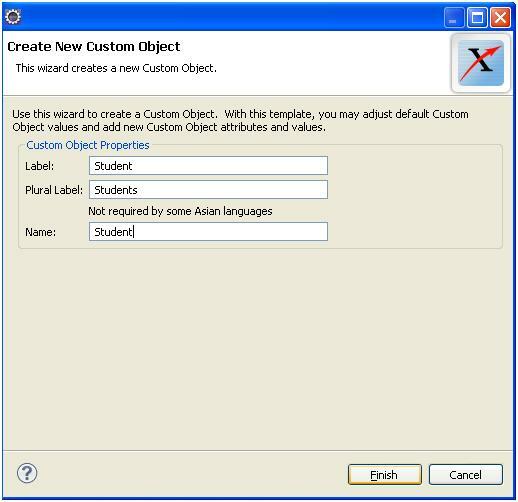 Go to Setup -> App Setup -> Create -> Objects and click on “New Custom object“. In the next article i will demonstrate, ho to create Fields in Salesforce. Getting below mentioned error message. Force.com Projects require an Organization with the metadata API enabled. API is not enabled for this organization or Partner. how to check whether API is enable or not? At Profile there is check box (Permission) for API. do u have any idea about how can i make an instance of my custom object, to be able to use in Apex Class ? Hi , I’ve written a Trigger to assign a task whenever we insert an OpportunityTeamMember to an Opportunity and i also written a Test Case for it but the code coverage is 0%. Can you please check it and tell me where it is going wrong. How you are adding this hardcoded line “otMember.UserId = ‘005900000023dh0’;”. You need to first insert User and then use ID of inserted user in above line. Hi, I am sorry i am brand new to salesforce so please dont think it as silly doubt and help me. I’ve changed it to below code still it is showing 0% code coverage but the Test is Pass. How you are checking test coverage ? Navigate to Setup | Develope | Apex Test Execution and from this place select your test class and run it. Coverage line will be visible in Development Console. Hi, After Running the Test class , I am refreshing the Trigger Detail Page where we can see the code coverage : 0% (0/15).